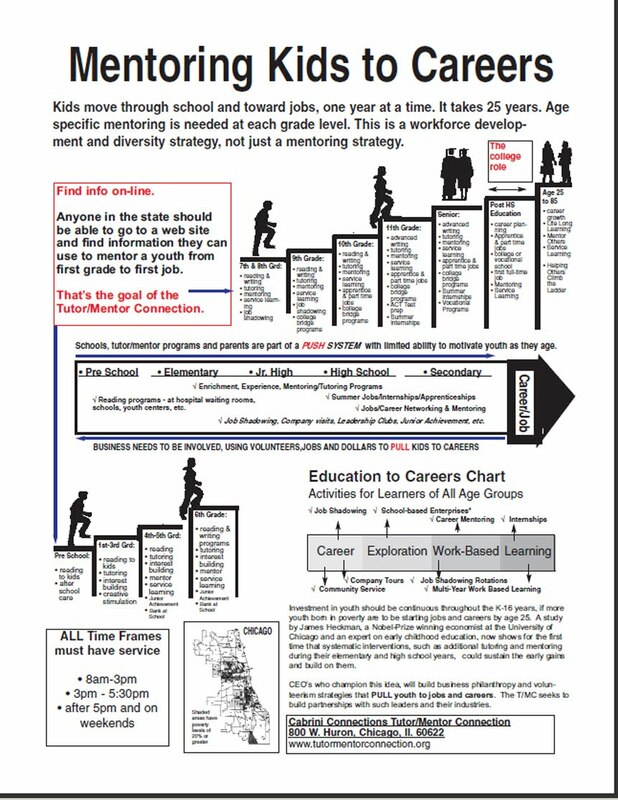 Our Vision: Because of the work we do, more youths born in poverty will start jobs and careers by age 25, and more volunteers will make a lasting commitment to tutor/mentoring. This website is a meeting place and knowledge center for people who want to make this vision a reality—in Chicago and in other major cities throughout the world. Throughout this site, we use graphics like the one shown above to visualize this as a long-term strategy that will take the involvement of many people, organizations, and leaders over the course of many years. The issue this site addresses, poverty in inner-city neighborhoods, is complex and extensive. The information hosted on this web site, therefore, provides a wide range of information in many different sections. It may be difficult for first-time visitors to know where to start, or what to look for. Thus, we hope you will browse the site like you would the first time you go to a new shopping center with hundreds of stores. Open the various sections and links to see what they offer, then go on to the next section. Bookmark those that you feel will be most useful to you so that when you visit again, you can spend more time there. 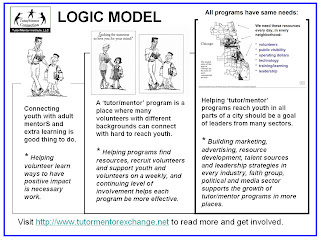 This graphic is a concept map intended to guide visitors through the information on the various Tutor/Mentor Institute, LLC and Tutor/Mentor Connection web sites. 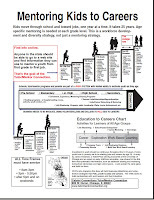 See concept map here. In Jan 2015 an intern from South Korea created a new version of this learning path guide, using Prezi, and then shared that via this YouTube video. By exploring this web site and making it a permanent resource for your own learning, innovation, and decision-making, we hope you and all visitors begin to understand where tutor/mentor programs are needed most, why they are needed, ways to get involved, and approaches to improving existing programs. The website links to many other sites, which can also be confusing. But again, a shopping center has many different stores. As you learn to move back and forth from one site to another--just like you go from store to store--we hope you will begin to get comfortable with this arrangement of information. We believe volunteer-based tutor/mentor programs are the bridges that connect volunteers, donors, and business leaders with the children, families, and schools on the other side of the socioeconomic divide. However, we don't have all of the answers. When we formed the Tutor/Mentor Connection in 1993 we said: "Let's try to learn everything that is known about this problem and also learn solutions that work in some places that could be working in other places if the money and volunteers were available." Thus, while you can go to five or six different websites hosted by the Tutor/Mentor Connection (T/MC) and the Tutor/Mentor Institute, LLC (T/MI), you can also go to more than 1500 other sites hosted by various organizations, universities, businesses, and the government. In addition, most of these sites were selected by the T/MC to be on our websites because they have libraries of links that point to even more extensive networks of information. If you spent enough time in this network of websites you could earn a Ph.D in this subject!! We hope to connect you and a growing number of these stakeholders through an ongoing, dynamic exchange of ideas, and ultimately we aspire to improve the availability and quality of tutor/mentor programs throughout the world. If you would like to become a registered and active participant in this community use the "contact us" button to introduce yourself.